If you own a Smith and Wesson M&P Shield, you probably have it for some tactical and defensive purposes, right? If so, you should definitely look into buying a set of M&P Shield sights for nighttime use. We’ve put together a list of what we think are the best Shield night sights, and we’ll let you know at the end of this review what we think is the top choice for the average gunowner. Although night sights are obviously intended for, well, night, we think your investment should be usable during all times of day. In order to do that, we suggest picking a pair of sights that utilize some type of reflective, contrasting colored ring around the tritium inserts. This helps avoid any glare you may experience during daylight. Although that’s not necessarily required, it’s something we would advise requiring based on our professional experience. That being said, enjoy this review of M&P Shield night sights! 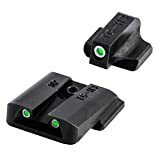 Materials – The Truglo Brite – Site Night Sights for M&P Shield handguns are made of CNC machined steel construction, and they come as a front and rear set. They have a specially smooth curve in their design to avoid snagging on clothing during a draw and so they fit comfortably in most holsters. They have traditional bright green tritium inserts, using the brightest tritium available on the market, but they don’t have any reflective colored ring around them. The pair of night sights together will add about four and a half ounces of additional weight to your S&W M&P Shield pistol. Performance – Overall, the Truglo Brite – Site Sights are some of the best sights for M&P Shield handguns because of their low cost and effective use. The tritium inserts are incredibly impressive, and they glow very brightly even in daylight. They work especially well in lowlight or pitch dark. Installation is quite simple, although you may have to do some adjustments, as they’re intended to fit a variety of M&P models. The one thing we wish we could change about the Truglo Brite – Site Night Sights would be to add a reflective ring around the tritium, like most night sights have. The contrasting colors would be more helpful in avoiding glare and acquiring your target more quickly. What we say – The Truglo Brite – Site M&P Night Sights cost only around $55 online, which is a great price for a set, and they also happen to be the cheapest option within this review. 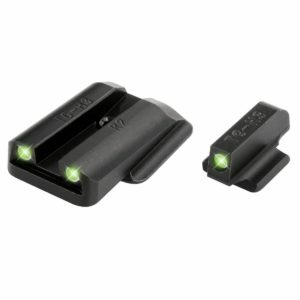 Despite any complaints, these night sights are very effective and are great for tactical and self defense use. We still highly suggest looking into this set of night sights. Materials – The AmeriGlo Bowie Tactical Night Sights for M&P Shield handguns are made of machined steel with an anodized matte black finish. This is another front and rear set, and they can be purchased with both green tritium in the front and rear or with green in the front and yellow in the rear, depending on where you purchase them from. White reflective rings surround each tritium insert in both sights. This model is made with a particularly low profile, designed by the M&P customizer David Bowie. The rear sight notch is made wider and deeper than the factory version to aid in centering the front sight as quickly as possible. Performance – AmeriGlo make some of the best night sights for M&P Shield pistols, and the Bowie Tactical model is no exception. 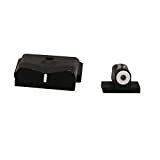 Again, this is another front and rear sight set that is easy to install, but it may need some modification, as it’s intended to be a “one size fits all” for most M&P models. This one has the white ring around the tritium inserts, so we do like this one a little bit better than the previous option. We also like the lower and wider notch in the rear sight, as this should help with many people when finding their target. The design of these sights is simple and low profile, so there really isn’t much to complain about! What we say – The AmeriGlo Bowie Tactical M&P Shield Sights will cost a little over $85 online, which, again, is pretty wallet friendly for most gunowners. We can definitely advocate this choice as one of the best purchases you could make for a pair of night sights. Materials – The XS Sight Systems Big Dot Shield Night Sights is a very unique and original product, as it offers – you guessed it – a big dot on the front sight. The front sight features a traditional tritium dot which is surrounded by a significantly large white circle that is intended to reflect large amounts of light. This allows the sight to be used in any lighting during any time of day. The rear sight features a special “V” shaped notch, which is large and shallow to avoid interference with the front sight. A simple white notch allows for easy acquiring of your target. 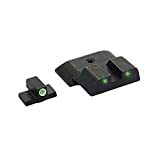 These night sights are also designed with an ergonomic shape, so they can be easily drawn and reholstered without snagging on any materials. 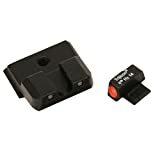 Performance – The design of the XS Sight Systems Big Dot Shield Night Sights is very innovative, and you likely won’t find this design in any other brand. For anyone who wants to avoid using lasers altogether, and would rather use tritium sights during all times of day, this unique set is for you. We have no actual complaints about the function of the sights themselves, but they should be properly installed by a professional gunsmith. This means you may have to shell out a little extra money for the installation. However, the costs could be very worth it to many gunowners. What we say – The XS Sight Systems Big Dot M&P Shield Sights will cost you anywhere between $80 and $90, depending on where you purchase it from. Please also remember to include any installation costs with this price when making a final decision for yourself. With that in mind, this investment is very well worth it. Materials – The Trijicon HD Sights are some of the best night sights for M&P Shield for a multitude of reasons. For one, the green tritium inserts come with a warranted 12 years of life. Second of all, the sights have been designed specifically to address the needs of tactical shooters. The front sight has a bright orange ring made of photo luminescent paint, and the rear sight has tritium outlined in black. The rear sight also has a low profile and wider notch, as well as specially designed serrated exterior to reflect light. Also with tactical use in mind, the surface of the rear sight is deeply hooked to aid in emergency one handed slide operations. Performance – Ah, Trijicon. This brand is considered by many to be the best of the best when looking for night sights. For obvious reason, Trijicon offers the best night sights for M&P Shield handguns that are used mainly for tactical reasons. Every part of the design is made to ensure nothing will interfere for those moments when you need to act quickly. Quick operations, quick target acquisition, and quick shooting are all emphasized here. However, this is another option where you will need to also invest in professional installation. If you want a brand you don’t have to question, though, the Trijicon HD Sights are for you. What we say – The Trijicon Night Sight for M&P Shield will cost you anywhere from $120 to $140, depending on where you purchase it from. 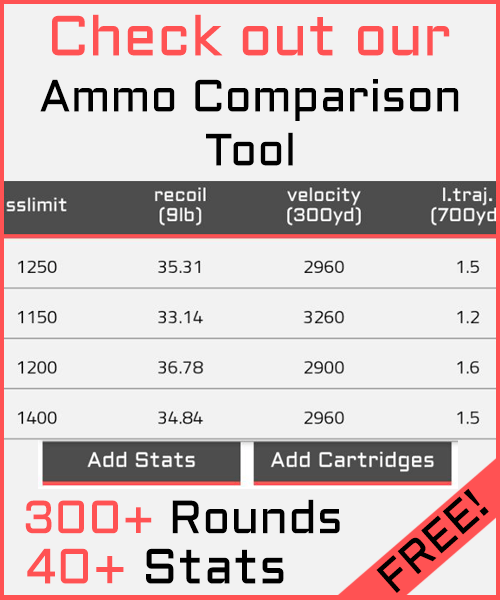 Trijicon is truly top of the line, so it’s a worthy investment to anyone who can afford it. We highly suggest looking into this brand and their HD night sights for any other handguns you own, as well. 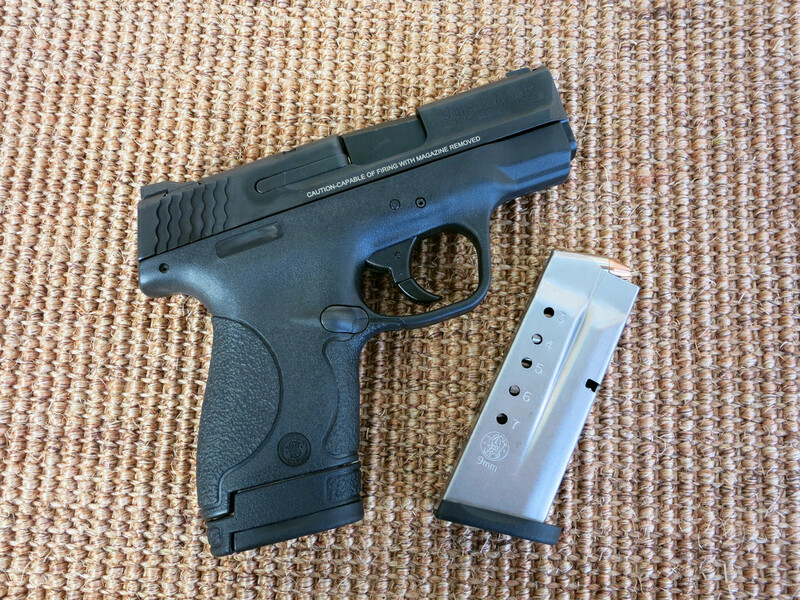 We think the best sights for M&P Shield handgun owners would be the XS Sight Systems Big Dot. Although they’re not the cheapest option, they are still sold at a reasonable cost. We also believe that making a small investment to have the sights professionally installed is worth it and a very good idea. We love the unique and original design of these front and rear sights, and we are huge fans of the large reflective white circle around the tritium dot. Every part of this pair of sights has been designed for all-day use and convenience for function. We absolutely think if you’re looking into buying a pair of M&P Shield sights, you should check out the XS Sight Systems Big Dot model.